These days, the fashion industry can seem like an exclusive club. With outrageous price tags and fine-tuned styles, designers practically choose the edgy girls or monochrome-loving bloggers who sport their pieces. Even the outside world is feeling more divided than we'd like to admit, but luckily, some brands are still trying to spread the love. 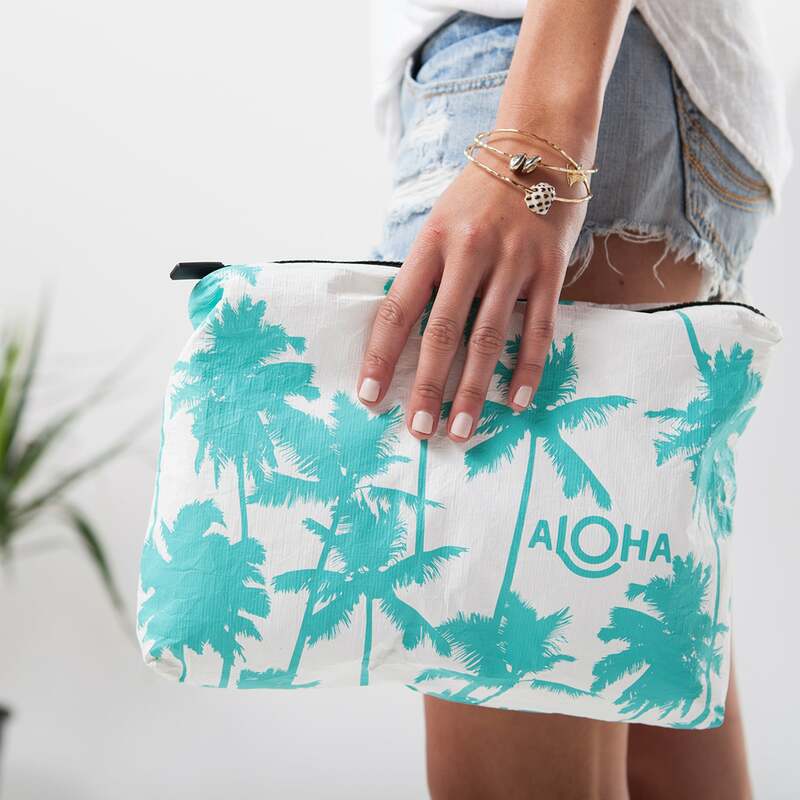 Among the surprises in our POPSUGAR Must Have Box this June, you'll find a beach-ready pouch from ALOHA Collection. Born from the combined dreams of two longtime friends, this do-it-all travel staple in the brand's fun Coco Palms print will take you from the beach to hot yoga to a tropical night out. "It was Heather's dream to be an international businesswoman, and it was my idea to have a product that I like and make it," co-founder Rachael Leina'ala tells POPSUGAR. But when she and Heather Aiu decided to join forces, they never expected to build a brand that represented them so well. As a private flight attendant with a passion for surfing, Rachael spent her days jet-setting across coasts and riding waves around the world. Constantly on the go, there was never enough time for her wet swimsuits and beach gear to dry but, try as she may, she just couldn't find a bikini bag that fit her needs. That's when she came up with a plan. "In one of my random travels, I came across this material called Tyvek and ended up making a pouch out of it because the material is superlightweight, durable, and waterproof," Rachael says. "Being a flight attendant, you only have so much real estate in your suitcase, so I was really careful about what I put in there and how thick a bag would be." Knowing that her friend Heather — then working in private mortgage banking — was longing to put her college major to good use and pursue international business, one quick phone call was all it took to get their business rolling. Before the duo could get the word out, they needed a name for their brand. "We were trying to come up with these names, and there was just nothing catchy and I started to panic," Rachael says. "It has to be who we are." With her family being from Oahu and Heather's own Kauaian heritage, the one thing that bound them together most provided the answer they were looking for. "I was like 'Heather, we're both Hawaiian! Let's call it ALOHA!' And then that way we could spread something good into the world, because ALOHA means love, and that's also our roots." 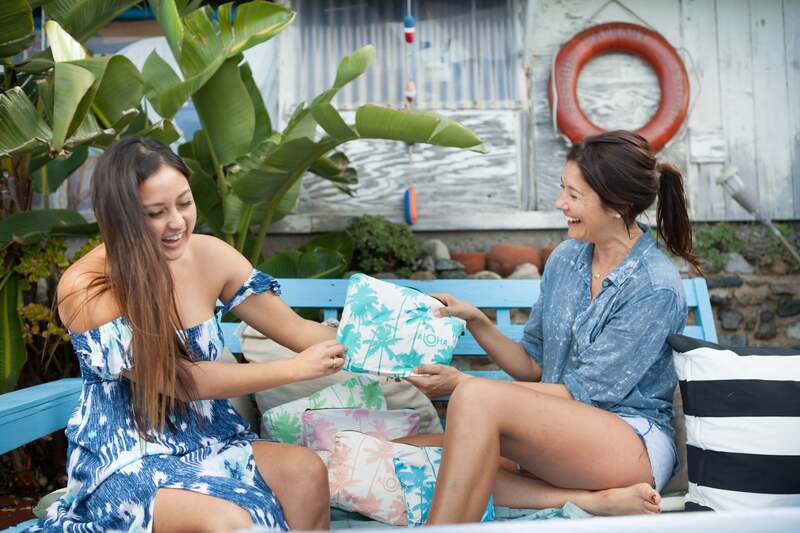 To round out their line of colorful and palm-printed pouches, ALOHA Collection offers everything from totes and duffels to wear-anywhere hats. And next up for the brand? A line of sarongs inspired by their world travels and crafted from local artisans in Bali. True to their ethos, ALOHA Collection donates 5 percent of their annual proceeds to Hawaiian conservation in hopes of protecting the beautiful place they call home. "Hawaii is hands down one of the most beautiful places on the planet, and I think everyone should be able to see the beauty that we were able to experience growing up," Heather said. With a goal of creating an inclusive brand rooted in community, even those who aren't from Hawaii or have seen it up-close are welcome to join their crew. They both agree: "aloha is for everyone." If their do-it-all beach pouch has you dreaming of Summer days, our June Must Have Box is packed with tropical surprises and on sale now.